The prowess of Chinese creative abilities in the decorative arts in the 19th and early 20th centuries was well known globally, but, while much has been written about Chinese textiles and on the influence of the East on European styles of the time, the story of the influence of Western formats and tastes on the manufacture of Chinese jewellery in the period has, amazingly, never been told. 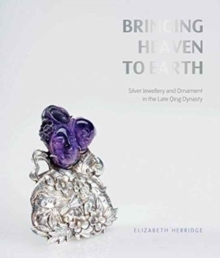 In examining 50 objects of exatraordinary quality from an important private North American collection, this book seeks to redress the situation and reveal the splendour of silver and silver-gilt jewellery of the late Qing dynasty. An ancient and sophisticated culture, the Chinese - who have since records begun made up about a quarter of world's population - had almost everything they could need or want within their own borders ...except for silver. The metal had long cultural, commercial and governmental associations but had to be imported largely from South America, after both national and Japanese reserves were quickly exhausted by huge Chinese demand. Beginning in the mid 19th century - where the story told here begins - after two successive defeats in the Opium Wars, sixteen treaty ports were established on coastal and inland cities, enabling Western merchants freer movement and trade with the Chinese. The 50 pieces of jewellery and ornament presented here have been beautifully photographed and carefully documented. In superb unrestored condition, the objects incorporate exotic materials like tiger-shark teeth, teak wood, amber, precious and semi-precious stones from India and Sri Lanka, enamel, as well as finely carved and pierced nephrite, jadeite and lapis lazuli. Daoist imagery and motifs dominate but with the inclusion of some surprising Buddhist imagery as well. Though not from the imperial collection of the Qing, these exquisite pieces were seemingly commissioned and worn by prosperous members of the society from all over the vast country. The differences in manufacture, even in this varied sample of 50 items, is striking. Their appeal is more than just aesthetic, and their design and decoration speak of the social, religious, economic and political climate of their time. Questions regarding the sale and consumption of these object are discussed, and changing local and foreign tastes in the wake of the fall of the Qing dynasty and the establishment of the Republican period are also addressed.